During the many years of armed violence and persecution in our Nation, more than 250,000 of our fellow Liberians lost their lives, the Nation’s economy and infrastructure--houses, schools, clinics, roads and bridges were damaged, and more than 900,000 Liberians, out of a pre-civil war population of about 3.2 million, were forced to flee their homes and seek refuge in other countries. As time past, an appreciable number of the more than 900,000 Liberians, who were forced to flee their homes in Liberia, (1) settled in economically advanced countries; (2) gave birth to thousands of children in their host countries; (3) got married to citizens of other countries; (4) became naturalized citizens in their host countries; (5) took military and other employments in their host countries; (6) and acquired skills and expertise in various sectors. As we work to transform our Nation from a post-conflict status into a stable, prosperous, and leading democracy, the Liberian government is urged to create an environment that will welcome and encourage Liberians at home and Non-Resident Liberians alike to adjust the new lives they have built so as to contribute more to our Nation’s development. One of the best ways to get Liberians to adjust the new lives they have built is for this Honorable Legislature to pass legislation that officially permits Liberians to have dual citizenship. The legislation will facilitate travel to and from Liberia and also remove obstacles to investment opportunities for Liberians who may want to contribute more to the Nation’s development. The international trend is increasingly moving toward permitting dual citizenship, as countries recognize the reality of intense globalization, technological advancements, and the immense benefits of non-resident citizens traveling, living, and working abroad. Presently more than 150 countries, including African countries such as Benin, Burkina Faso, Ghana, Mali, Nigeria, South Africa, and Uganda, officially permit dual citizenship in some form. And there is overwhelming evidence that these countries are benefiting from dual citizenship. As the number of countries permitting dual citizenship continues to grow, the Liberian government is called upon here to answer an inescapable and important question regarding its people at home and abroad: when will Africa’s oldest independent republic, which is recovering from years of armed violence and persecution and has a large, active, and productive disapora population, officially recognize the reality and immense benefits of its citizens having dual citizenship? Citizenship by Birth: Birth within the territory of Liberia does not automatically confer Liberian citizenship. There is an exception, however, for a child born to unknown parents. A child born or found within the territory of Liberia acquires Liberian citizenship if the child’s parents are unknown, their citizenship cannot be established, or they are stateless. Citizenship by Descent: A person acquires Liberian citizenship at birth regardless of the person’s actual country of birth, if at least one of the person’s parents is a citizen of Liberia. Citizenship under this method permits a person to keep dual citizenship before reaching the age of majority (presently age 18). Upon reaching the age of majority, the person must renounce any other citizenship in order to keep Liberian citizenship. Citizenship by Naturalization: Liberian citizenship maybe granted through naturalization upon the applicant’s satisfaction of the necessary requirements, or upon the waiver of such requirements by the President of Liberia. Upon information and belief, loss of Liberian citizenship is found in Chapter 22 of the Alien and Nationality Law and Volume II of the Liberian Code of Laws Revised. Voluntary Loss: Voluntary renunciation of Liberian citizenship is permitted by law. A Liberian may renounce his or her Liberian citizenship through the nearest Liberian consulate. 1. Any Liberian who obtains naturalization in a foreign state upon his or her own application, upon the application of a duly authorized agent, or through the naturalization of a parent having legal custody of such person; provided that citizenship shall not be lost by any person under this section as the result of the naturalization of a parent or parents while such person is under the age of 21 years, unless such person shall fail to enter Liberia to establish a permanent residence prior to his twenty-third birthday. 2. Taking a citizenship oath or making a formal declaration of allegiance to a foreign state or to a political subdivision. 3. Exercising a free choice to enter or serve in the armed forces of a foreign state, unless prior to such entry or service, the person receives approval from the President of Liberia. 4. Voting in a political election in a foreign state. Section 22.2 of the Alien and Nationality Law provides that loss of Liberian citizenship is automatic if a person performs any of the four acts specified in section 22.1, and that the Liberian government is not required to institute any proceeding to nullify or cancel the person’s citizenship. 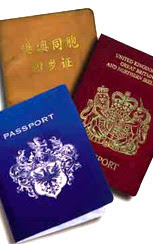 Dual citizenship is the simultaneous possession of two citizenships. The concept recognizes that a person may have and exercise rights and responsibilities of citizenship in two countries. Dual Citizenship by Birth: For example, a child born in the United States to a Liberian citizen will acquire American citizen by birth and Liberian citizenship by descent. Similarly, a child born in Liberia to a foreign parent and a Liberian citizen acquires Liberian citizenship by descent and may also acquire the citizenship of the foreign parent. Dual Citizenship by Marriage: A Liberian citizen may automatically acquire the citizenship rights of his or her foreign spouse’s country, because some nations’ laws permit a person to become a naturalized citizen without going through the naturalization process upon the marriage to one of their citizens. Such a Liberian could legally hold dual citizenship, travel on the passport issued by his or her foreign spouse’s country, and without voting in that country’s election or serving in its armed forces, may hold dual citizenship in perpetuity because he or she obtained the foreign citizenship upon the marriage to a citizen of the foreign country and not by his or her formal application or upon the application of a duly authorized agent. 1. Because the Liberian government does not have an independent and credible way of knowing when a Liberian citizen becomes a naturalized citizen of another nation, dual citizenship can arise by default under the Nation’s unofficial don’t-ask-don’t-tell policy. 2. A Liberian citizen who serves in the armed forces of another country without the approval or knowledge of the Liberian government may still retain Liberian citizenship by default under the Nation’s unofficial don’t-ask-don’t-tell policy. 3. A Liberian citizen who acquires dual citizenship at birth and is not permitted by the law of a foreign country to renounce its citizenship may still retain Liberian citizenship, because some countries continue to recognize its people as citizens even after they become naturalized citizens of other countries. 4. A Liberian citizen who acquires dual citizenship at birth and fails to renounce his or her foreign citizenship at the age of majority may still retain Liberian citizenship, because the Liberian government does not have an independent and credible way of determining whether the foreign citizenship was renounced. 5. An applicant who meets the necessary requirements, recites the renunciation oath under Liberian law, and becomes a naturalized Liberian citizen may still retain his or her foreign citizenship regardless of what Liberian law says, because some countries’ laws require that their citizens may only renounce their citizenship before a competent authority within those countries’ borders or at their individual foreign embassies. The argument has been made that one cannot serve “two masters” at the same time, and that it maybe “divided loyalty” to officially allow Liberians to have dual citizenship. While we acknowledge the argument, we respectfully believe that dogma should not be put ahead of pragmatism. In fact, it would be an understatement to say that the pre-civil war Liberian society as we knew it has changed. Years of armed violence and persecution in our Nation caused more than 250,000 of our fellow Liberians to lose their lives. The Nation’s economy and infrastructure---houses, schools, clinics, roads and bridges were damaged. There was mass exodus in which more than 900,000 Liberians were forced to flee their homes, seek refuge in other countries, and built new lives in those countries. Moreover, we know it is not serving “two-masters” or “divided loyalty” when people with two parents take care of mom and dad. We also know it is not serving “two masters” or “divided loyalty” when people with girlfriends, boyfriends, wives, or husbands take care of their families and the families of their girlfriends, boyfriends, wives, or husbands. Laws are often amended to address society’s needs. The pre-civil law Liberian society as we knew it has changed, and so should our citizenship laws. There is no doubt the Constitution gives the Liberian government the power to pass a law that provides for loss of Liberian citizenship. However broad the power of the government to pass such a law maybe, the government is required to stay within the limits set by the Nation’s Constitution. One of the constitutional violations regarding Chapter 22.2 of the Alien and Nationality Law is that it attempts to deprive Liberians of the constitutionally protected rights of citizenship without first providing for a hearing judgment consistent with due process of law. As the Honorable Senators and Representatives of the 52nd National Legislature are aware, procedural due process under Article 20(a) of the Constitution of the Republic of Liberia provides that no person shall be deprived of life, liberty, security of the person, property, privilege or any other right except as the outcome of a hearing judgment consistent with due process of law. Procedural due process has been defined by various decisions of the Supreme Court of Liberia to be the following: (1) a tribunal competent to pass on the subject matter in dispute; (2) notice must be given to the party-of-interest to appear in person, with counsel, or both, to present evidence on his or her behalf; (3) the party-of-interest must have been duly served with process and must have submitted to the jurisdiction of the tribunal; and (4) where the party-of-interest, upon proper notice, fails to appear to present evidence on his or her behalf, the accusing party must still prove each element of its allegation before the tribunal. As the self-executing enforcement provision of Chapter 22 of the Alien and Nationality Law, which provides for automatic loss of Liberian citizenship upon a person’s performance of an act under section 22.1 does not meet any of the safeguards of procedural due process as announced by the Nation’s Constitution and Supreme Court, the Honorable Legislature is urged to officially recognize dual citizenship so as to permit all Liberians to benefit from the legal loophole section 22.2 of the Alien and Nationality Law has caused. The legislation should be retroactive so as to clear doubts and save judicial resources, because if a section is invalid on its face it never had the force of law and nothing will stop Liberians who were said to have “lost” their Liberian citizenship pursuant to sections 22.1 and 22.2 of the Alien and Nationality Law from seeking a declaration from a competent Liberian court that the invalid sections did not affect their status as citizens of Liberia. According to UNMIL statistics, there are about 450,000 Liberians living in the United States and Canada, another 250,000 more living in Western Europe, and hundreds of thousands more living in West Africa and other parts of the world. However, the number of Liberians living in the United States, Canada, and Western Europe is actually higher than what the statistics show. For example, the United States did not include Liberians who are naturalized American citizens or U.S.-born Liberians in its count, even if they claim Liberian citizenship. Moreover, World Bank and other sources show that Non-Resident Liberians, particularly those living in the United States, Canada, and Western Europe, send more than $55 million U.S. dollars and goods in kind home annually to family members and friends in Liberia, and that between a quarter and a third of the population in Liberia benefit regularly from such overseas remittances. Official recognition of dual citizenship is in Liberia’s best interest. Even countries that have not experienced the kind of problems Liberia has have gone through great lengths to accommodate their non-resident sons and daughters and make them an active participant in the development of their countries of birth. We also know that the majority of Non-Resident Liberians who fled Liberia did so because of the many years of armed violence and persecution in our Nation, but they have always been and continue to be Liberians at heart. They have kept faith with Liberia by maintaining supportive ties with families and friends in Liberia and, on numerous occasions, have served as some of the most effective ambassadors Liberia has had in lobbying friendly governments for assistance and promoting a better understanding about the Liberian culture and people. In addition to the remittances Non-Resident Liberians send home to families and friends, the Nation can also benefit from the professional, technical, entrepreneurial skills, investment opportunities, expertise, and international presence of its non-resident citizens as we work to transform our Nation from a post-conflict status into a stable, prosperous, and leading democracy.